CONTENT: One NCAA jersey shower curtain measuring 72 x 72 inches, One bath towel measuring 30 x 54 inches, One hand towel measuring 16 x 30 inches, and One polyester-jersey window valance with a screen-printed logo, 88 inches x 14 inches. 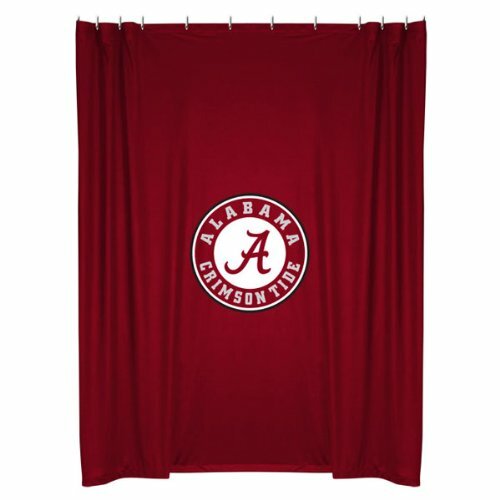 One NCAA Alabama Crimson Tide logo shower curtain, One window valance measuring 88 inches wide x 14 inches long, one bath towel, 30 x 54 inches, and one hand towel, 16 x 30 inches. Iowa Hawkeyes COMBO Shower Curtain, 4 Pc Towel Set & 1 Window Valance/Drape Set (84 inch Drape Length) - Decorate your Bathroom & SAVE ON BUNDLING!